I went for something quick and simple with this, I’m quite pleased with the result for the amount of time spent on it. Just one more figure to paint now so I guess I will get it done before Christmas, but we have family visiting already so it will be hard to find time. The Gargoyles skin was base coated Beasty Brown and then given an Umber Wash to shade it (twice on the wings), highlights were added with Beasty Brown and then final highlight with Beasty Brown mixed with Bleached Bone. It’s tongue and gums were painted with Heavy Red, then high lighted with a mix of Heavy Red and Bleached Bone, adding more Bleached Bone for the subsequent highlights. It’s eyes are Gory Red and the teeth, toe and finger nails were all painted the same, just a base coat of Earth and then a little blending with Bleached Bone and then a wash with Umber Wash to smooth things out. 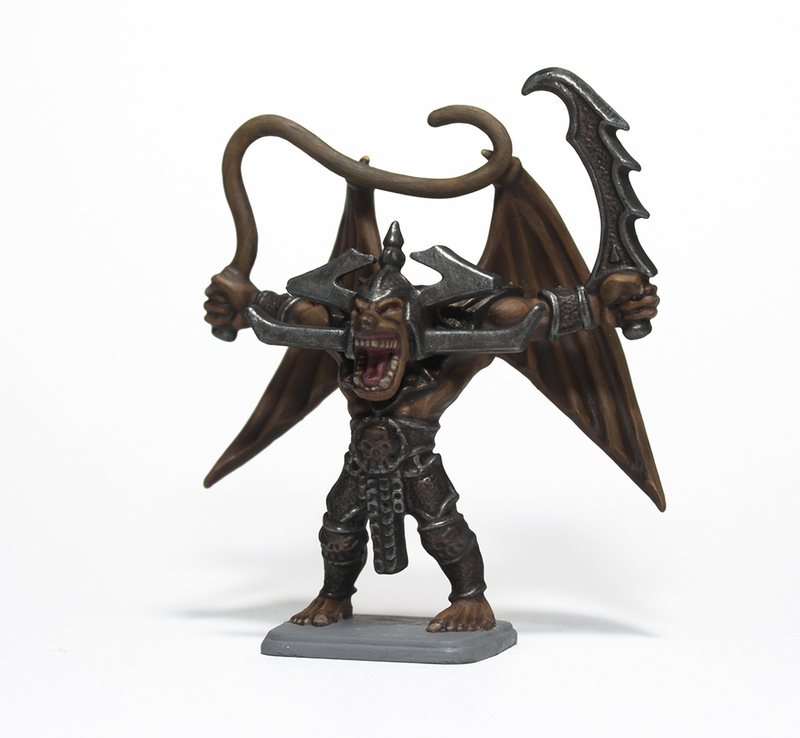 The gargoyles whip was painted with a base coat of Leather Brown, then two coats of Umber Wash then a dry brush of Leather Brown followed by a light dry brush of Earth. The armour and sword were painted Tinny Tin with the edges done in Gunmetal, all of it was then shaded with a mix of Umber and Black Wash, a light dry brush of Tinny Tin or Gunmetal was then done to bring out the raised areas. The armour straps were painted Black and then highlighted with Black mixed with Cold Grey. The last of the four heroes is now done, hopefully I can get the Gargoyle and Chaos Sorcerer done in the next few days. I’m really not sure about the things I’ve painted on the tunic, I may try and redo them a bit better as it looked too plain without them. The wizards face was painted with a Dark Fleshtone base, then Dwarf Skin, shaded with Flesh Wash, then layered with Dwarf Skin, then Dwarf Skin mixed with Elf Skin and then finally a highlight of Elf Skin. The hair was base coated with Leather Brown, shaded with Umber Wash, highlighted with Leather brown and then a final highlight of Leather Brown mixed with Bleached Bone. The cloak was painted with Hexed Lichen and then highlighted in layers of Hexed Lichen mixed with increasing quantities of Bleached Bone. The tunic was base coated with Bleached Bone, then increasing quantities of Dead White was added to the Bleached Bone to highlight. His Belt was painted with Beasty Brown and then given an Umber Wash. I painted the trousers with Night Blue, Imperial Blue, then Imperial Blue mixed with Magic Blue, and finally Magic Blue on the most prominent areas. I did the little blue triangles on the tunic with this too. His boots and gloves were painted with Heavy Brown, given an Umber Wash, highlighted with Earth, and finally Khaki. The wizards staff is Heavy Sienna, Umber Wash and then streaked with Heavy Sienna mixed with Gold Yellow, the top is Bright Bronze, then Glorious Gold and finally Polished Gold. The last big hurdle has gone now with all sixteen of the Orcs painted, I did them a simple colour scheme which helped a lot. 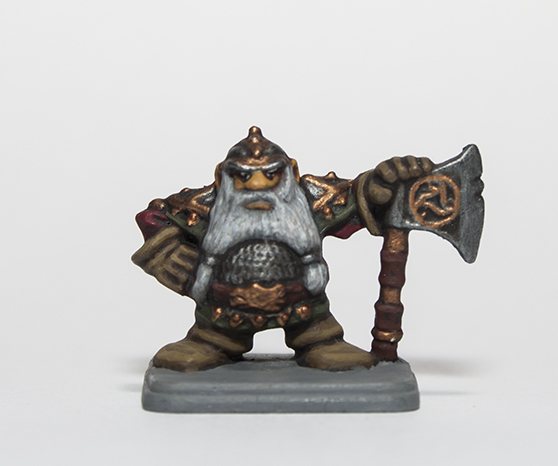 Just three more miniatures to paint, going to get cracking on the Wizard now. The Orcs skin is base coated with Heavy Green then shaded with Umber Wash, Heavy Green is used again on the raised areas and then a final highlight of Heavy Green mixed with Bleached Bone. Their eyes are Gold Yellow, then shaded with a mix of Yellow and Red Ink and just given a dot of Black for the pupil. The two protruding teeth are base coated with Earth, then blended with Bleached Bone and then finally given a coat of Umber Wash to darken them a little. The tunic and boots are painted with Heavy Brown, shaded with Umber Wash and then highlighted with Heavy Brown again. The belt is simply Beasty Brown shaded with Umber Wash, all the metal is Gunmetal shaded with Umber and Black Wash, and then highlighted with Gunmetal again if it needs it. The wooden weapon handles are Heavy Sienna, Umber Wash and then streaked with Heavy Sienna mixed with Gold Yellow. I’ve finished the four Chaos Warriors now, I’ve gone for the dark look but was tempted to one in each colour of the Chaos gods. My list of figures to do is still pretty big (Wizard, Chaos Sorcerer, Orcs, Gargoyle) but I’m getting there. From a Black undercoat the armour was painted with Gunmetal mixed with 2 parts Black, the edges of the armour were then Painted with Glorious Gold. The armour was then shaded with Black Wash and then highlighted with the Gunmetal and Black mix again, and the gold with Glorious Gold. The chain mail and the axe head were painted with Gunmetal mixed in equal quantities with Black, shaded with Black Wash and then dry brushed with Gunmetal. The axe handle was painted with Charred Brown, highlighted with Earth. The grip on the handle is Heavy Brown, shaded with Umber Wash, highlighted with Heavy Brown again and then given a final highlight of Desert Yellow. The horns on the helmet were base coated with Charred Brown, then blended with gradually lighter towards the tip with Heavy Brown, Earth and Bone White. The gloves and boots were base coated Black and then highlighted with Vallejo Model Colour Black Grey you could probably mix a little Cold Grey with Black to get the same colour but my bottle was empty. I then gave it a Black Wash to smooth things out a little. The small patches of trousers you can see beneath the armour are Black mixed with Cold Grey and then highlighted with Cold Grey. The small area of flesh on show was painted with Dark Fleshtone then Bronze Fleshtone, a highlight of Dwarf Skin and then a final highlight of Dwarf Skin mixed with Elf Flesh. His beard is base coated with Cold Grey then because there isn’t a lot of detail to dry brush I painted streaks onto it with Cold Grey mixed with Stonewall Grey, I highlighted the streaks with Stonewall Grey and then with Ghost Grey, finally a few fine streaks of Dead White were applied. 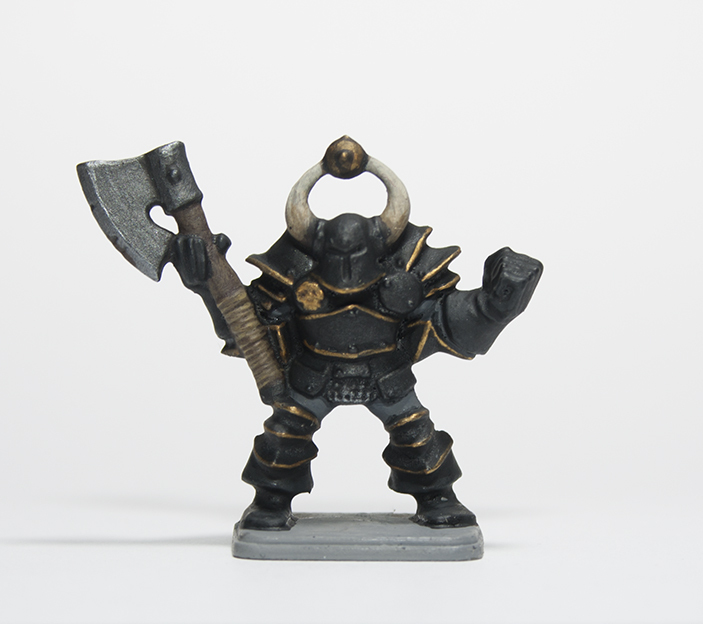 His armour and axe head is base coated Gunmetal and shaded with a Black Wash, Gunmetal is used a highlight again. The gold areas are painted with Glorious Gold shaded with Umber Wash with a Glorious Gold highlight and then a Polished Gold final highlight. The garment under the armour is painted with Cayman Green, shaded with Black Wash, highlighted with Cayman Green and then a final highlight of Cayman Green mixed with Bleached Bone. The Dwarfs shirt is base coated with Heavy Red, given a Black Wash, highlighted with layers of Gory Red and then a mix of Gory Red mixed with Bloody Red, then a final layer of Bloody Red. The boots and gloves are base-coated with Heavy Brown then shaded with Umber Wash, highlighted with Earth and then a final highlight of Earth mixed with Bleached Bone. I wanted the Fimir’s skin to be brown rather than green so I base coated with Earth, gave it an Umber Wash, highlighted with Earth again and then finished off with Heavy Brown on the most prominent areas. The teeth and toenails were painted with a base coat of Desert Yellow then layered with Desert Yellow and Bleached Bone in increasing amounts until it was pure Bleached Bone, finally they were given a wash of Black and Umber. The eyes are Desert Yellow, shaded with a mix of Red and Yellow Ink. The small bumps on the tail are just Desert Yellow. I used a base coat of Tinny Tin on the armour and bracelets, followed by a mix of Black and Umber wash, then highlight ed with Brassy Brass and the wash mix again last of all. The armour straps are Dark Fleshtone, shaded with Umber Wash and then highlighted with Dark Fleshtone and then Dark Fleshtone mixed with Bleached Bone. The axe head and chain mail are Boltgun Metal, washed with a mix of Black and Umber, then highlighted with Boltgun Metal again. The axe handle is Desert Yellow with three coats of Umber Wash. 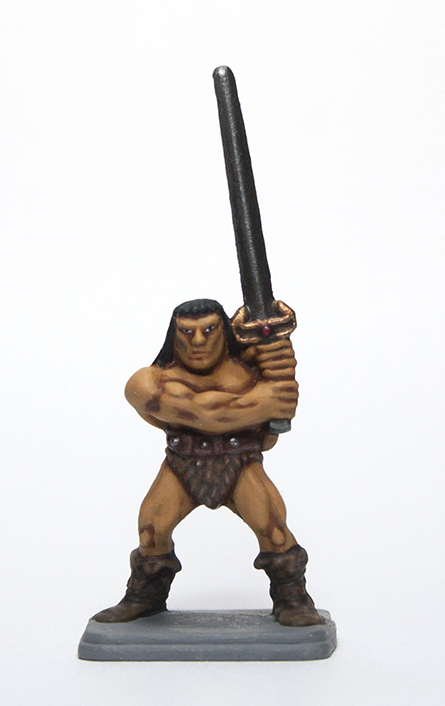 The Heroquest Barbarian is done, he’s probably the worst sculpt from the game as he has very little real detail. I’m working on the Dwarf already and then it’s onto some more Twisting Catacombs scenery pieces. From an undercoat of Black the flesh was basecoated with Dark Fleshtone then layered with Bronze Fleshtone then shaded with Fleshwash, a highlight of Bronze Fleshtone was added and then finally Dwarf Skin on the most prominent features. The hair is Black with a highlight of Black mixed with Cold Grey. The sword blade, pommel and studs on the belt is Gunmetal, shaded with Black Wash then highlighted with Gunmetal again, while the quillon on the sword is Glorious Gold shaded with Fleshwash, highlighted with Glorious Gold again and then finally with Polished Gold. The Barbarians belt is Dark Fleshtone, shaded with Umber Wash and then highlighted with Dark Fleshtone and then Dark Fleshtone mixed with Bleached Bone. The boots and the strapping are Charred Brown and then highlighted in a couple of stages with Charred Brown mixed with increasing quantities of Bleached Bone. The fur on the boots and loincloth is Beasty Brown then shaded with Umber Wash, highlighted with Beasty Brown and then finally with Beasty Brown and Bleached Bone. The Goblins are all done, they took me a bit longer than expected because I painted all the Twisting Catacombs doors I have too. I’m not entirely sure I’m happy with the skin as prefer more natural tones than bright green but overall I’m pleased. I will have to think whether I want the Orcs to be the same or darker though. 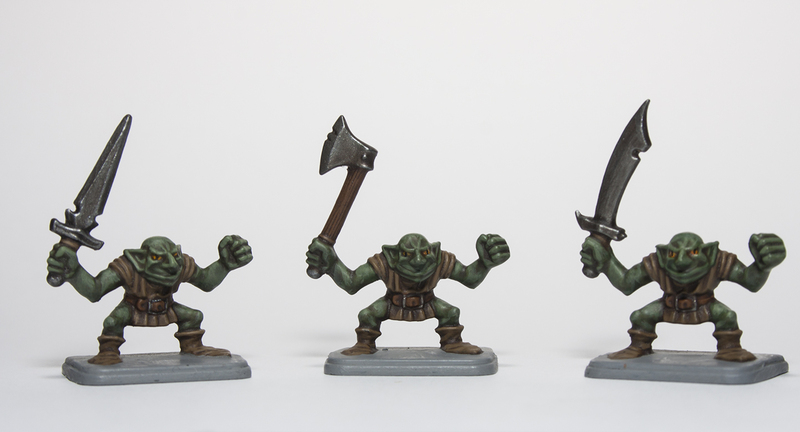 I’ll probably have a go with another hero now to break up the monotony, painting guide for the Goblins down below. 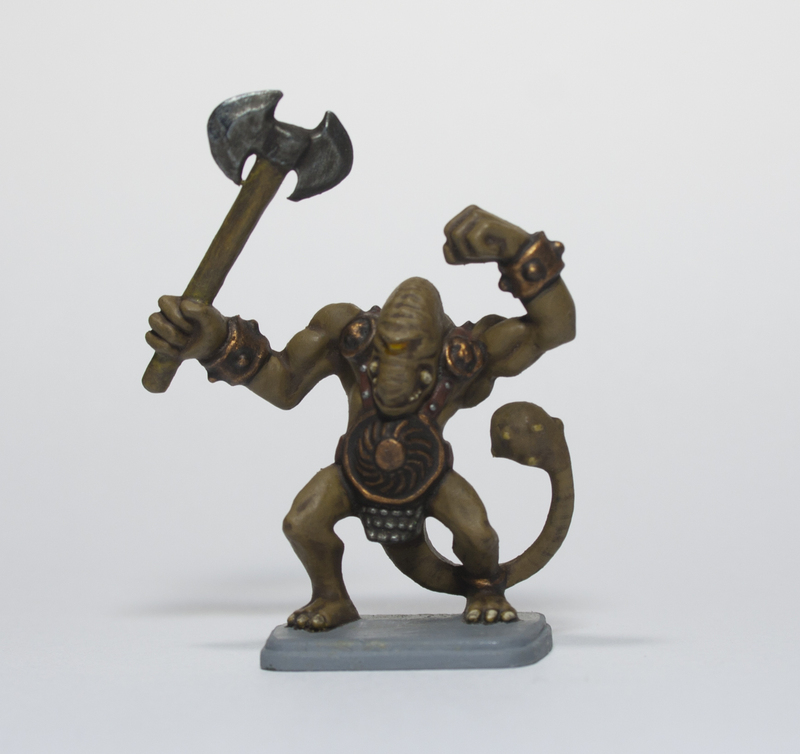 From a Black undercoat the Goblin skin was base coated with Army Painter Army Green then washed with Vallejo Umber Wash, then a Green Wash and then Umber Wash once again. The skin was then layered with Army Green again. The eyes are Gold Yellow then shaded with a mixture of Red and Yellow Ink, then a Black pupil was added. The clothes, shoes and weapon grip are all painted the same with a base coat of Earth followed by an Umber Wash, then layered with Earth and then finally with a mix of Earth and Bonewhite. The Belt is Beasty Brown then 2 coats of Umber Wash and a highlight of Beasty Brown. The Goblins weapons and belt buckle are base coated with Gunmetal then given an Umber and Black mix Wash, highlighted with Gunmetal and then given an Umber and Black Wash again. The shaft on the axe is a base coat of Heavy Sienna, an Umber Wash and then a light dry brush of Heavy Sienna mixed with Gold Yellow. 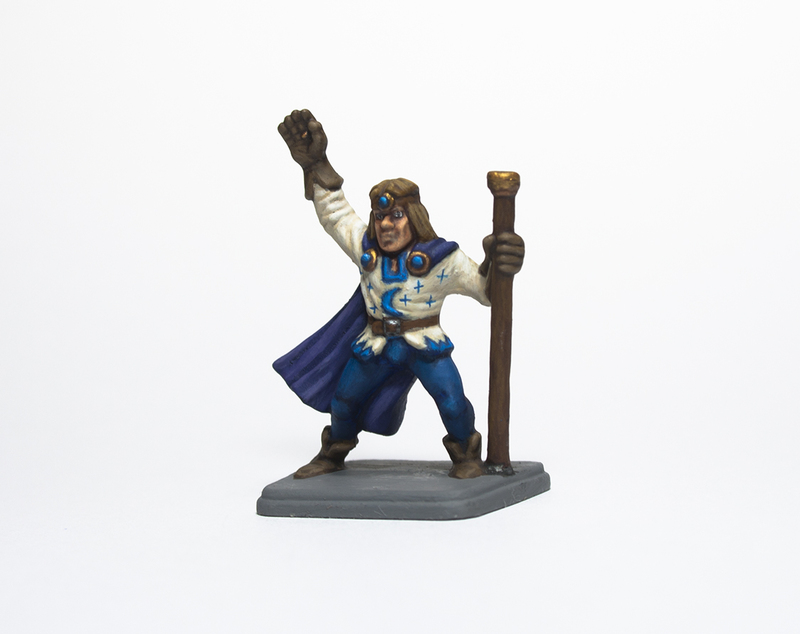 I varnished the whole model with Army Painter Anti Shine Matt Varnish. Some time last year I backed Twisting Catacombs Dungeon Scenery by Zealot Miniatures, it arrived earlier this week and it is fantastic quality stuff with great detail and a perfect replacement for Heroquest’s cardboard furniture. 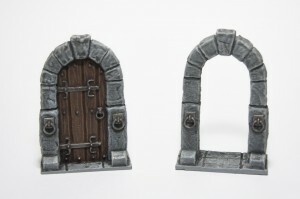 So I set aside the Goblins I’m working on and started on some doors. I’ve got lots more furniture and scenery work on but for now I’d better get back to the Goblins. The doors are very easy to paint I started with an all over black undercoat. I started on the door frame and base with a heavy drybrush of Cold Grey was first applied so that most of the Black undercoat was covered except in the deepest recesses, I then shaded the model with a mix of Black and Umber Wash. I then drybrushed with Cold Grey, Stonewall Grey and finally Ghost Grey getting lighter with each colour. Because drybrushing leaves a grainy finish I used a very watered down Black Wash (75% water) to smooth out the drybrushing and darken the model a little. The wooden door was base coated with Heavy Sienna, given a watered down Black Wash then highlighted with Heavy Sienna mixed with Bleached Bone in equal quantities, the final highlight was a mix of 2 parts Heavy Sienna, 1 part Bleached Bone and 2 parts Gold Yellow. The metal detailing was base coated with Gunmetal then just given shade with an equal mix of Black Wash and Umber Wash. A few edges were highlighted with Gunmetal again. To finish I used Army Painter Anti Shine Matt Varnish. The first of the Heroes are done, I actually enjoyed painting this one which is good because I have quite a large Warhammer 3rd Edition Wood Elf army to paint at some point in the future. I’ve tried to paint the Elf like he appears on the box artwork and I don’t think he’s too far off. 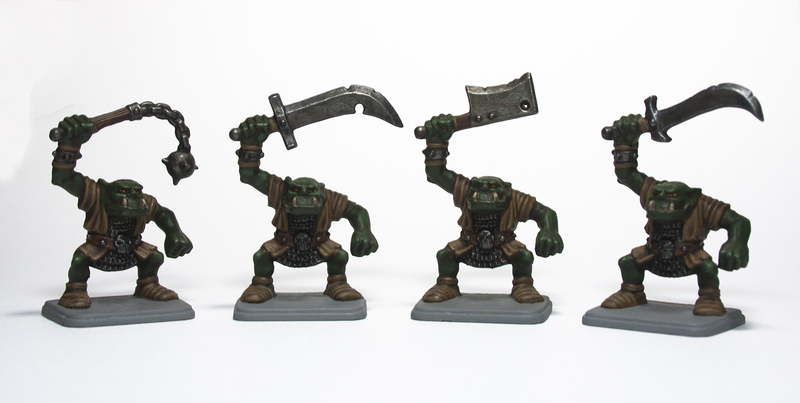 I think I’ll move on the Goblins now as I’ve bought the Kellar’s Keep expansion again so I have a few to paint. The Elfs belt, boots, and pouches were painted with Beasty Brown, then covered with an Umber Wash, followed by another Umber Wash to darken it a little more, then Beasty Brown before a final highlight of Beasty Brown mixed with Bleached Bone. The studs are Gunmetal then a Black Wash and a final highlight of Gunmetal. I Painted the shirt with a basecoat of Heavy Red, shaded with Black Wash, then worked through the highlights with layers of Gory Red, Scarlett Red and finally Bloody Red. The sword blade was painted with Gunmetal followed by a Black Wash, I then highlighted the blade with Gunmetal and Chainmail. The pommel and hilt are Glorious Gold followed by Fleshwash, highlighted with Glorious Gold again then finally with Polished Gold on the edges. The Elfs skin was painted with a basecoat of Dark Flesh, then Dwarf Flesh was added to all but the deepest recesses followed by a Fleshtone Wash. I highlighted with Dwarf Flesh again and then final highlights with Elf Flesh. The Eyes are just Dead White with a dot of Black for the pupil. 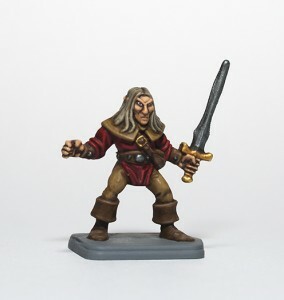 The hair is basecoated with Heavy Brown, shaded with Umber Wash, highlighted with Heavy Brown mixed with Bleached Bone and then a final highlight of pure Bleached Bone.